Knowing when to prune your trees is extremely important if you want to make sure that they remain healthy and grow the way you want them to grow. While you can’t entirely shape a tree’s health or its growth pattern, properly pruning it can go a long way towards ensuring that both are optimal. However, knowing when to prune your trees is important, as pruning them during the wrong time can cause more harm than good. Knowing when to prune your trees is extremely important. The two most common times that people prune their trees are either during the summer or the winter months, with both having a different effect. Pruning during the winter when your trees are dormant is one of the most common times that this is done. If done correctly, it results in a large amount of growth occurring once it warms up in the spring. Because of the increase in growth, winter pruning is something that should only be pursued if growth is one of your goals. While it’s safe to prune your trees during the winter, it’s recommended that you wait until the coldest month of winter has passed, meaning that you should do it either at the very start of winter or, ideally, at the end of it. Also, don’t be alarmed if you notice sap flowing out of your tree when you prune it; this will end once spring comes along. Pruning during the summer is also a common practice. Unlike pruning during the winter, pruning during the summer is done in order to curb growth, such as by slowing down the growth of undesired branches or the overall development of the tree. Summer pruning also is done in order to fix any perceived flaws of the tree, such as limbs that are not aesthetically pleasing. Pruning flowering trees can enhance the flowering of them greatly. If your tree blooms in the spring, you should only prune it once its flowers start to fade or drop off. If you tree flowers during the middle of or towards the end of summer, it should be pruned either during the winter or the beginning of spring. You never want to prune your tree in the fall. Pruning during the fall can leave your tree vulnerable to diseases and fungi. Not only do any “open wounds” on trees heal slower during the fall, but the spores of fungi are far more spread out during the fall months. Pruning during the fall should always be avoided. 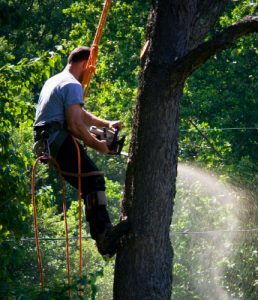 If you’re interested in having a professional arborist prune your trees or at least advise you on your best course of action, make sure to contact Lewis Tree Service. We have close to 30 years of experience pruning trees in the Santa Cruz and Monterey areas, and we’ll be able to make sure that your tree is pruned with the purposes of meeting your goals. Get in touch with us today for a free quote and to have one of our ISA certified arborists sent to assist you!